This is my mother-in-law's recipe, unique and interesting. She is a woman of few words but with amazing culinary skills. The stuffed squids with coconut is my favourite dish and when we are in Goa on a visit, she will surprise me by making it for me. 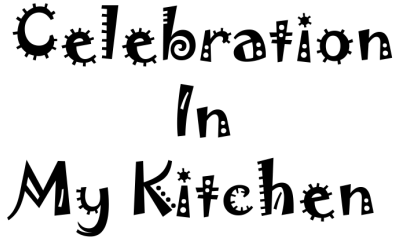 No cookbooks have this recipe neither you will find it online nor in any restaurants. I have seen, eaten this dish only after I got married and have been preparing it since then. 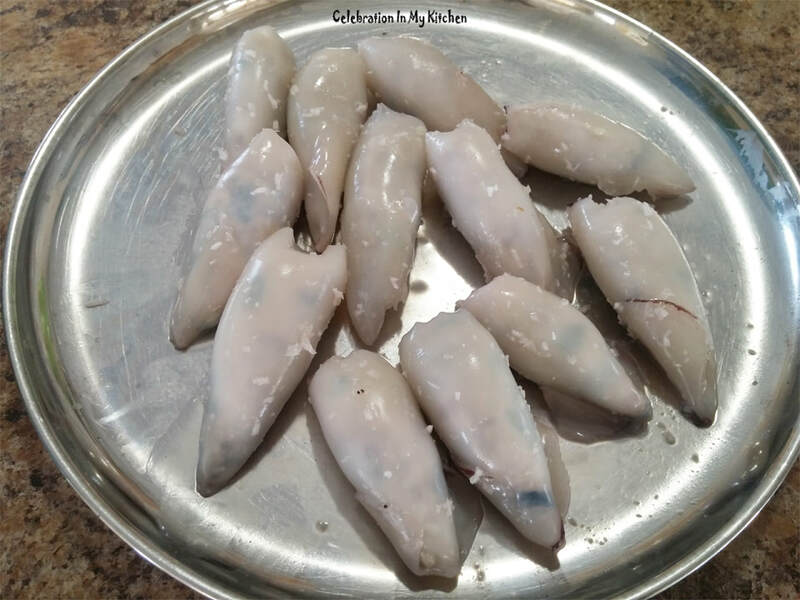 The filling is a mixture of fresh grated coconut, chopped tentacles, onions, green chillies, tiny pieces of kokum, vinegar and salt which is stuffed into each squid. They are cooked in very little oil and its own juices. 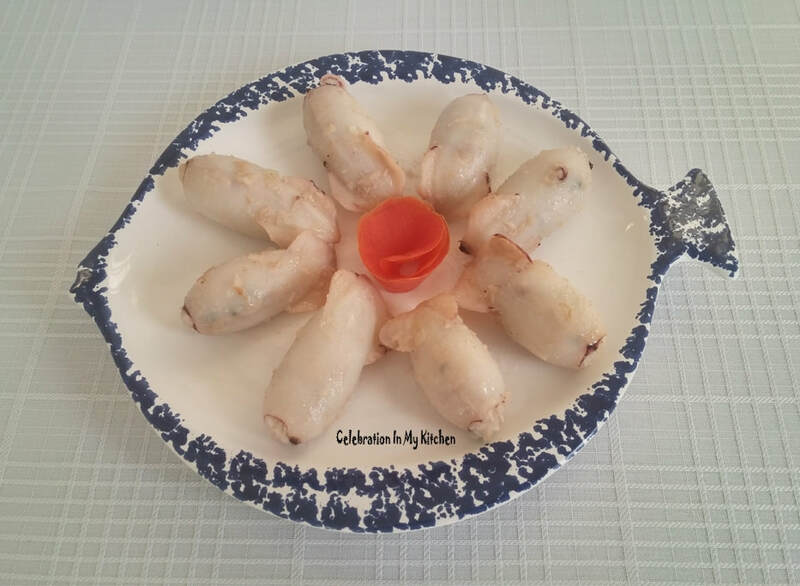 An easy dish to prepare with patience needed in cleaning and stuffing the squids. 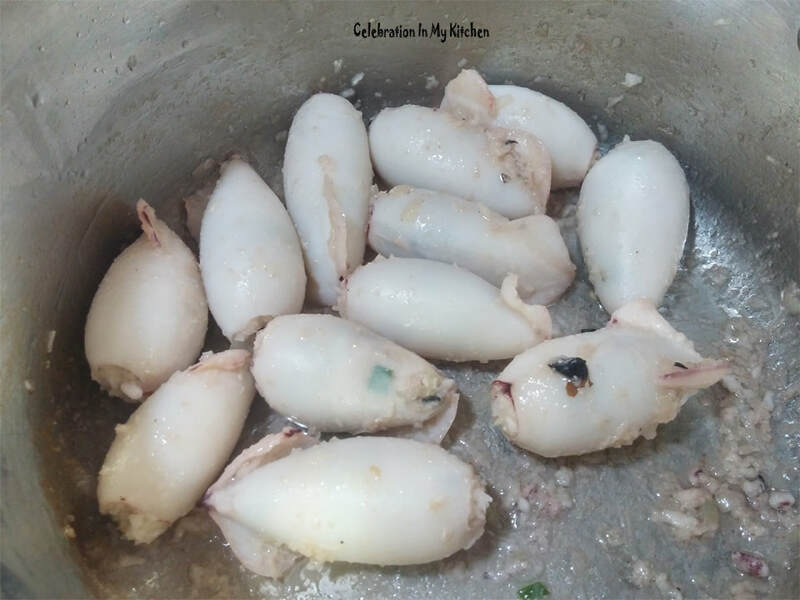 Besides green chillies, there is no spice so the squids are mild in taste with the sweetness from the coconut balanced with the sourness from the kokum and vinegar. With the first bite, you experience the juiciness from the coconut filling along with the moist, tender squid, a real party in your mouth. 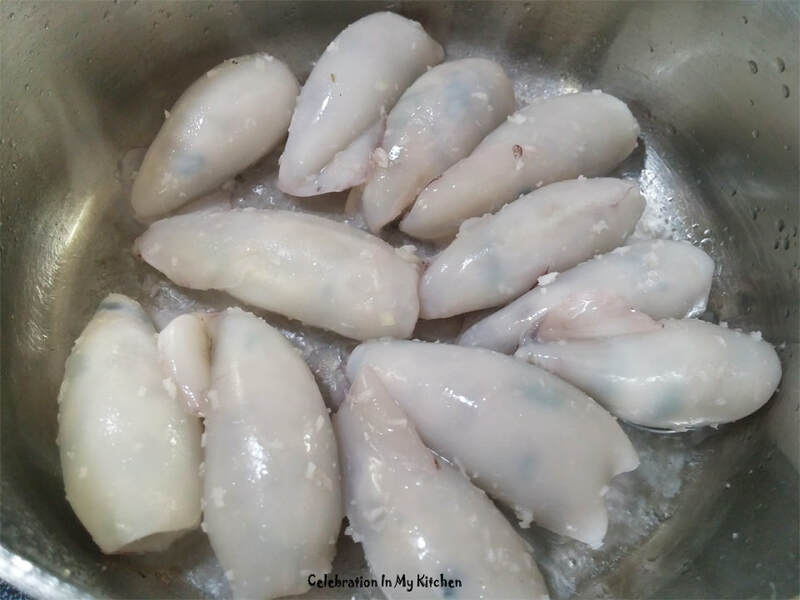 Like most Goan dishes, leftover squids taste delicious the next day too. Care should be taken not to overcook them the first time. When purchasing squids, select small or medium-sized ones. They are tender than the larger ones. Squids are a good source of protein and low in fat. Rich in vitamin and mineral content. Ideal for individuals suffering from rheumatoid arthritis who have low selenium levels in their blood. Squids have an abundance of this mineral. It contains large amounts of phosphorus necessary for stimulating calcium required for the building of bones and teeth. Clean squids separating the body from the tentacles. Discard the ink bag along with the eye, keeping the tentacles. Clean the pocket inside out ensuring to remove the outer surface of the mantle, internal organs and cartilage. Wash the squid pockets and season with salt. Set aside to drain well using a colander placed over a bowl for 15 minutes. Rinse and cut reserved tentacles into small pieces. Mix with rest of the ingredients and prepare the filling. Stuff the squid pockets three-fourth with the filling leaving room for them to expand while cooking. On a high flame, heat a pan and add oil. When oil is hot, add the squids. You will notice that they will start to release a lot of moisture, change colour and turn opaque. Remove the squids onto a plate when cooked through. Continue to cook the liquid down till it reduces and thickens. Transfer the squids back into the pan, stir to coat and check for seasoning. Shut off flame and serve. This is a dry dish. ​Serve squids with the main meal. 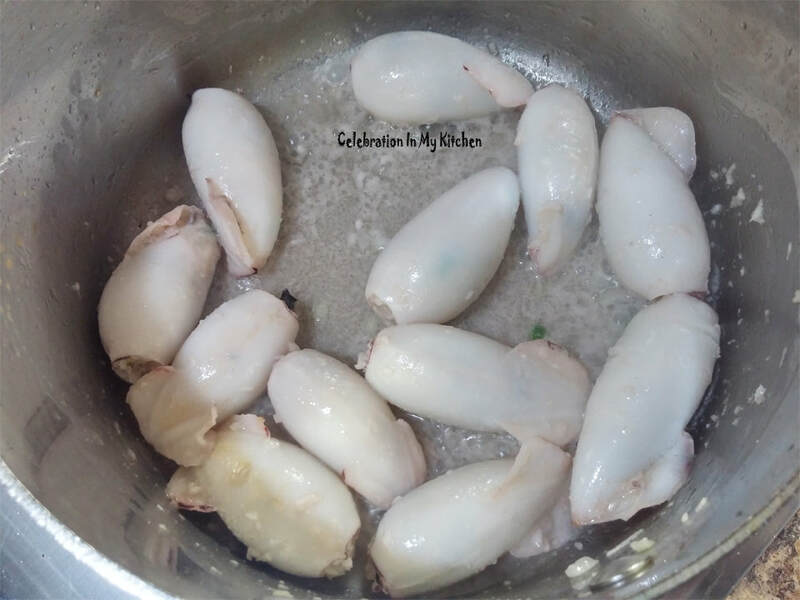 If moisture released is less (as seen in the above pictures), then continue to cook squids in the pan without taking them out onto the plate. Do not overcook the squids and maintain their tenderness.